I've been thinking more about the inflation system I posted earlier this week. It didn't have the elegance I was really hoping to achieve. I wanted to be able to tell at a glance how valuable it would be to sell a good to a particular market. Here's another way of doing that. The cards above represent cities along Mansa Musa's pilgrimage route. They begin with 1-3 random cubes and the remaining spaces stay empty. Musa moves from west to east, then east to west, along the dots indicated below the cards. Each time he lands below a column, he fills it with up to three random cubes. $ Value of cubes = (number of empty spaces on that card) - (number of cubes of that color on that card). So if the blue player above were to sell a red cube to the city on the far left, she would earn $4 because there are four empty spaces on that card. Selling a blue cube here wouldn't earn as much because this city already has so many. Selling a blue cube here earns only $2. (Four empty spaces, minus two). Selling goods earns VPs = (number of empty spaces on that entire row) - (number of cubes of that color in the entire row). So if the blue player above were to sell a red cube to the top row, she would earn four victory points because there are four empty spaces in the entire row. Selling it to the middle row would only earn three victory points (four spaces, minus one). Selling to the bottom row would only earn two victory point (four spaces, minus two). So we have three basic methods of determining units of value. CARDs determine the dollar value of any particular cube. ROWs determine the victory point value for selling goods. COLUMNs are what get filled up when Musa arrives. Thematically, I was having trouble figuring out what to call these. I got some good advice from folks on Twitter, especially Ben Marshalkowski and T. C. Petty. I think cards will stay Cities, columns will be the East and West District of that city, and rows will be social castes. This creates some interesting natural in-game language. For example, if you were to consider the top row to be Nobles, you might say, "The nobles of the second city have everything they could want, no point in selling there. But no Nobles have red cubes, and the Nobles in the first city are hungry for more of anything, I'll sell my red cubes there." And perhaps the castes offer different rewards for selling to them. Perhaps Nobles earn you the most money, Merchants earn a balance of money and victory points, and Peasants earn you little money but lots of victory points. Yup. Feeling pretty good about this iteration. Things get even more interesting when you mess with the grids. Conjoined spaces count as just one space. Anywhere without a space doesn't count as a space. A random shuffle and rearrangement can make some rows much more valuable than others. I think adding bonus tokens to the axes can add even more replay value. Hm! Pretty neat! Especially the custom cards. I expect cards come with their initial state on them. The row thing is a bit hard to fathom, IMO. What about earning VP based on the number of adjacent cubes of the same color, even on different cards? This would give an incentive to spread a trend across cities and be the first to capitalize on it in a new city. Also, money and VP earnings would be more at odds. Custom cards would work nicely with adjacency too - I can even see the point of having 4 or 6 space cards. Isn't the board going to fill up too fast? Maybe players should be able to buy in bulk (anything in their column at the same time). Yeah, I'm testing this out at home and there are some basic economies that need to be adjusted. For example, right now you could just park in a spot and earn more money selling the same cube back to he exact same market. Idea to model market saturation: each time you sell a cube, a cube of the same color is added on top of the card. The cubes on top of the card are taken into account in order to compute the value of cubes of a given color. These cubes are removed when Musa enters the city. Or, more simply, sell one cube, add two cubes to the card. Alternatively, cubes could represent demand instead of goods. The price would be the number of cubes on the card. Selling would remove one cube from the card and one from the player. I'm not sure how to integrate the neat idea about empty spaces with this, though. On your turn, you may buy one cube or sell two cubes. You can only sell a set of at least two cubes. You can't sell just one cube. Furthermore, there are bonuses you earn for selling sets of three, four or five cubes at a time, as indicated by the randomly placed tokens around the border of the play area. When you sell a set, you place one cube down the card and discard the remainder back to the general supply. The placement of that cube indicates the caste you're selling to and what bonuses you earn for it. For example, the nobles give you an X token when you sell three cubes to them. Collect X Y Z tokens to earn 10 bonus points at the end of the game. After some testing, I think traders should move from space to space on the cards rather than along the side like Musa. This way, you must land on an empty space to sell a good there. You must also land on a space with a cube in order to buy that cube. 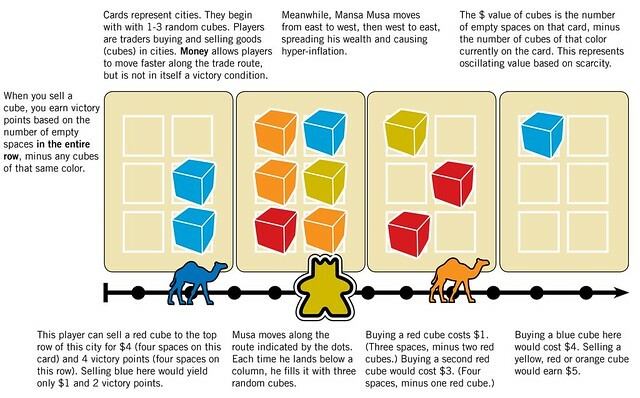 When determining value, any space with a meeple is considered occupied, even if there is no cube on it. Thus, the "buy-and-sell" bug is further patched.